The FBI arrested two animal rights activists today for allegedly freeing mink and other animals from fur farms, and vandalizing the property of animal-abusing businesses. Joseph Buddenburg, 31, and Nicole Kissane, 28, were charged under the Animal Enterprise Terrorism Act, a 2006 law that reclassified a wide range of petty criminal activity as “terrorism” if done in the name of harming the profits of animal enterprises. The government alleges that since the summer of 2013 the two caused hundreds of thousands of dollars in damage to corporations that they viewed as being cruel to animals. 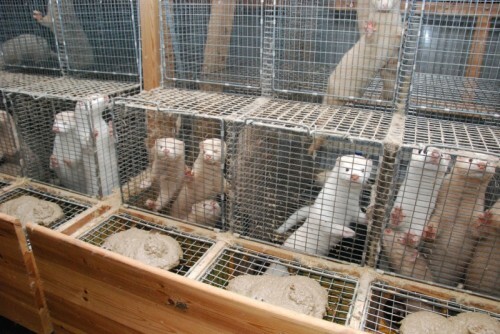 They are alleged to have freed 6,000 animals, including mink and bobcat, from fur farms in Idaho, Iowa, Minnesota, Wisconsin and Pennsylvania. They’re also alleged to have traveled the west coast of the U.S. and used super glue and glass etching fluid to vandalize the property of fur retailers. Companies targeted included Furs by Graf, a retail shop in San Diego, and another fur shop in Minneapolis. Buddenburg and Kissane are charged with conspiracy to violate the Animal Enterprise Terrorism Act, and are facing up to 10 years in prison. The arrests come in the lead-up to the national animal rights conference in Washington, DC — an event that gathers hundreds of animal rights activists from around the U.S., and dozens of international guests. The FBI did the exact same thing last year, when agents arrested two animal rights activists and charged them violating the Animal Enterprise Terrorism Act. In that case, like this one, the activists are accused of releasing thousands of animals from fur farms. In these and many other cases, the FBI uses rhetoric of terrorism in its press releases and sound bites, invoking the power of the word before these activists have even entered the courtroom. What Duffy fails to note is that the only thing that turns breaking windows into “domestic terrorism” in this case is that the accused are animal rights activists. If these crimes had been committed for any other purpose, it could not be charged under the law. And it would not be receiving the FBI’s public relations efforts. That message and its timing are not lost on the animal rights activists gathering in Washington this week. As I have reported extensively on this site and in my book, the FBI’s disproportionate focus on animal rights activists, and public messages like this one, has made everyday activists afraid of attending protests. It’s telling that Joseph Buddenburg, one of those arrested, was also one of the first people ever indicted under the Animal Enterprise Terrorism Act, in 2009; the AETA 4 were accused of chanting, protesting, and writing slogans on the public streets with sidewalk chalk. That case was dismissed. The arrests come on the heels of a string of shootings, hate crimes, and other violent attacks that have made international headlines. As the Washington Post reports, there have been 204 shootings in 2015 so far. That’s 204 shootings in 204 days. And, as I’ve reported here, there has been a 400 % increase in violence by right-wing groups since the 90s. If they are convicted, they face prison sentences higher than those of racist cross burners.